All Active Guardian Nation Members Get Access To Our Annual Happy Birthday America and Black Friday Sales. These sales represent MASSIVE savings with 30 to 70% off safes, holsters, and much more. Our first Black Friday sale in 2016 crashed our server due to the demand on the sale items and we’ve had to add some significant infrastructure to support these sales. 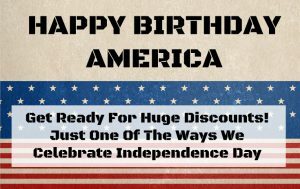 The Annual Happy Birthday America Sale celebrates American Independence. Every customer receives a collectible and commemorative hat and is entered into a drawing for a custom America painted and engraved handgun. Join today and be active each year in July and November to take advantage of these special Guardian Nation Member-Only Sales.